Flowpack Machines delivered by Bosch ensures a high quality with highly efficient production and a guaranteed delivery to your customers. Flowpack machines are designed to be easy to use and clean, format changes are easily done and the machines are safe to use. Together with our principals, we take care of supplying spare-parts and service for the packaging machines we deliver. Flowpack machines are built with either rotating cross sealing jaws or with horizontally moving “Long dwell” sealing jaws. You can choose between either heat sealing, cold sealing or ultrasonic sealing systems. Flowpack machines can be equipped with feeding of inert-gas to ensure a minimum amount of residual oxygen in the package. For your flowpack machine you can choose between several packaging styles: pillow bag, pillow bag with side gusseting, Eurohole in the cross seal or a clip-closing. The package can also have a tearing stripe or a tearing notch in the seam to have an easy opening of the package or a double sided tape for re-closing. Biscuits and crispbread can be packed either on pile, on edge or grouped in a tray. Depending on the product to be packed the film material in the machine can be fed either from above or inverted from underneath. 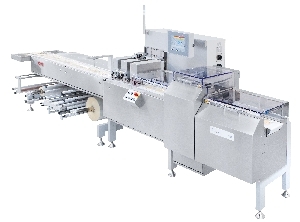 Bosch Flowpack machines can be separated into three groups based on the cross sealing system. In these Flowpack machines you can use either cold or hot sealing packaging material. Depending on the model the output is 1-2000 packages per minute. Typical products packaged with this method are confectionery, bars, and biscuits. With this Flowpack machine the sealing jaws move horizontally with the product/packaging material. This results in a longer sealing time for the packaging material. The output is 5 – 300 packages/minute. This method is chosen when the package needs to be totally gas tight, often used for medical products. The ultrasonic sealing is not done with heath, the sealing is made by vibrating the molecules in the sealing media by using ultrasonic frequencies. The output of these Bosch Flowpack machines is 25 – 150 packages / minute. This sealing technique is often used for medical packages and for products that are sensitive to heat. 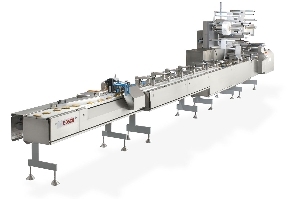 We also deliver complete packaging lines including vertical baggers, horizontal flow wrappers, dosing equipment and product feeding solutions as well as case packers. More information can be found at packaging lines.